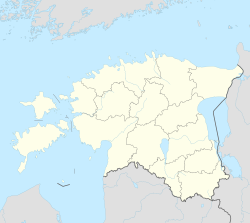 Tõrva (German: Törwa) is a toun (Estonie: linn) an municipality in Valga Coonty, soothren Estonie. It is situatit on the banks of Õhne River. Tõrva haes a aurie o 4.80 km2 (2 sq mi) an a population of 3,101 (as o 1 Januar 2009), makkin it the seicont lairgest o the three touns in Valga Coonty. Tõrva burgh (alev) gained its toun richts on 2 Julie 1926. The current mayor (linnapea) is Agu Kabrits. ↑ "Population figure and composition". Statistics Estonia. Retrieved 1 February 2010. ↑ "The mausoleum of Barclay de Tolly". Tõrva Linnavalitsus. Retrieved 2010-10-29. ↑ "Taagepera Manor". Tõrva Linnavalitsus. Retrieved 2010-10-29. ↑ "Holdre Manor". Tõrva Linnavalitsus. Retrieved 2010-10-29. ↑ "Helme Manor". Tõrva Linnavalitsus. Retrieved 2010-10-29. ↑ "The caves of Helme and Koorküla". Tõrva Linnavalitsus. Retrieved 2010-10-29. Wikimedia Commons haes media relatit tae Tõrva. This page wis last eeditit on 11 Mairch 2018, at 06:24.